Anyone who has ever been shown how a magic trick is performed will tell you two things. First, the gimmick is usually something very simple; after all people have been performing magic tricks for centuries, long before there was technological wizardry at their disposal. And second, once people do find out, they’re inevitably disappointed, because being fooled is most of the fun. 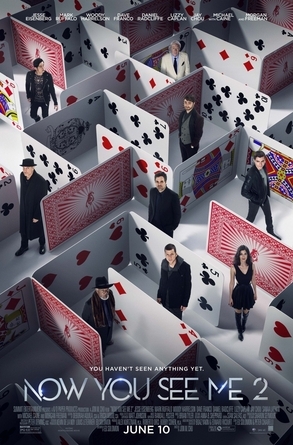 Now You See Me 2 is about magic and tricks both large and small. But it turns out that when the biggest tricks are revealed, the movie isn’t nearly as much fun as when the audience is being dazzled and confounded. Now You See Me 2 is a sequel to the surprise 2013 hit of the same name (lacking that inevitable final digit). The original movie followed a group of stage magicians known as the Four Horsemen who used their performances to cover up some high tech robberies. But these three guys and a gal weren’t just thieves; instead, they were out to expose some really bad guys, and the thefts and their magic act were all part of an incredibly convoluted long con. And, like most movies about con artists, the filmmakers were conning the audience right along with the bad guys. Any sequel would have a tough time topping the audacity and cleverness of the original movie, especially considering that the ending provided a double twist in which two main characters were revealed not to be as they initially appeared. But Now You See Me 2 soldiers on, en route to a heavily hyped, seemingly impossible final illusion. The illusion proves far from impossible, of course, but the real fun in the sequel is in the little bits of business along the way. As Now You See Me 2 opens, one year has passed since the Horsemen vanished at the end of their final performance, leaving their real leader, FBI agent Dylan Rhodes (Mark Ruffalo), seemingly bamboozled and the man who tried to discredit them, Thaddeus Bradley (Morgan Freeman), in jail. Since then, Rhodes, in astonishingly bad Clark Kent fashion, still pretends to be chasing them down, while Daniel Atlas (Jesse Eisenberg), Merritt McKinney (Woody Harrelson), and Jack Wilder (Dave Franco) get increasingly antsy remaining incognito. Eventually Dylan gives them a new assignment, exposing a crooked Steve Jobs-like businessman at his company’s annual meeting and a new fourth Horsewoman, Lula (Lizzy Caplan, replacing Isla Fisher, whose pregnancy necessitated a cast change). The mission goes spectacularly bad and the Horsemen and Dylan wind up being held captive by another fugitive, Walter Mabry (Daniel Radcliffe), a high tech guru who faked his own death so he could keep a low profile. Mabry blackmails the Horsemen into stealing a computer chip that would give him access to personal data on millions of people worldwide. The Horsemen manage to both steal the chip and elude Mabry and his father, billionaire Arthur Tressler (Michael Caine), whom they victimized in the first film. The action then moves to London, where the Horsemen threaten to reveal all about Mabry and Tressler as part of a huge New Year’s Eve spectacular magic show. If this synopsis sounds complicated, the actual movie is about three times as convoluted, with characters offering often contradictory explanations left and right for what’s going on. It’s actually all part of the stage patter, designed to keep the audience off balance while director Jon M. Chu and screenwriter Ed Solomon pull off one twist after another. That’s pretty much the same formula the filmmakers used in the first film, but it’s not quite as successful here. For one thing, the “impossible” tricks prove to be just that, impossible even once an explanation is offered. The big reveal at the end is an exceptional letdown, akin to finding out who the Wizard of Oz really is. If the big moments are a bit disappointing, Now You See Me 2 makes up for it with lots of smaller delights. The cast is nearly perfect for this type of film, blending smooth old pros Freeman and Caine with the younger actors, including Radcliffe, who fits right in (his Harry Potter persona comes in handy here). The best new addition to the cast is actually a very familiar face, McKinney’s brother Chase, who is also played by Harrelson with the addition of a frizzy hairpiece and a foppish demeanor. Chase is the jealous evil brother whose knowledge of Merritt’s proclivities helps the villains gain the upper hand at a key moment in the movie. While the first movie usually showed the various tricks, then explained them, Now You See Me 2 improves on the formula, by showing a couple of major heists as they occur, following the characters and letting the audience witness the various switcheroos and sleights of hand involved. One of those sequences, involving stealing the chip, goes on a bit too long, but each of the Horsemen gets his or her chance to smoothly palm and manipulate the card containing the chip, while the hapless security guards never have a clue as to what’s going on. Director Chu (best known for his work in various break dancing movies) isn’t as accomplished a set piece director as Louis Leterrier, who helmed the first film, was, and it shows to a certain extent here. Now You See Me 2 has a number of fight and chase scenes, all of which eventually rely on one or more of the Horsemen using trickery to get the better of their opponents. Leterrier did the same thing in the first movie, but he was a lot more adept at it. Despite some rapid editing here, Chu’s sequences aren’t as smooth or as much fun to watch. The best films about con games and con artists (and, at heart, both Now You See Me movies are elaborate long cons) save their best moments for the end, when the audience (and typically the duped individuals) finally realizes what has happened. The reaction of both audience and victims at the end of Now You See Me 2 isn’t as satisfying as the similar moment in the first film or, indeed, as the audience might expect. Fortunately, the movie and its dazzling cast has a lot of fun along the way, with enough dazzling moments to distract from the clunkers. The result is not Houdini, but it is the cinematic equivalent of a pretty decent opening act.